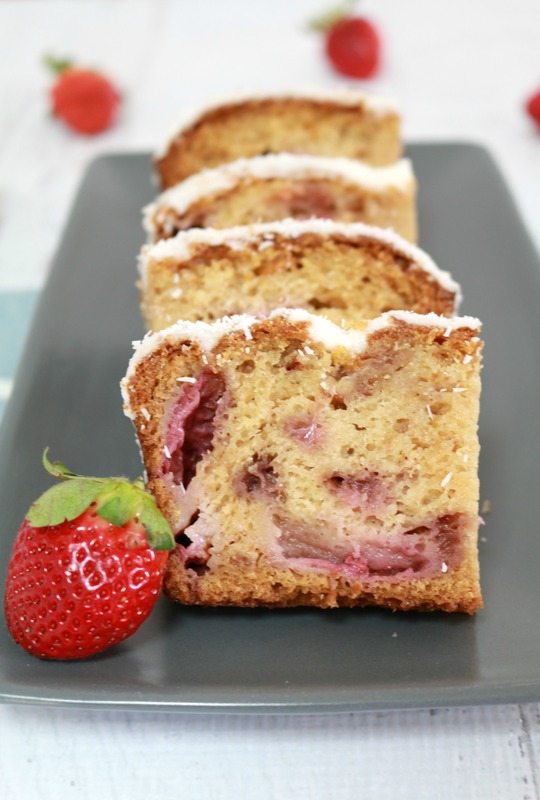 This delicious Lemon Glazed Strawberry Loaf is bursting with sweet strawberries and topped off with a tangy lemon glaze. Fresh or frozen strawberries can be used! I am absolutely loving the beautiful, fresh and delicious strawberries that are around at the moment. Last week I bought two punnets of strawberries for $2.60… yes $2.60!! Gosh I can’t even tell you how excited I was. I’ve become so used to seeing strawberries being sold for $5.00 a punnet and so you won’t be surprised when I tell you I bought a lot of strawberries that day… a LOT!!!! And so of course when I got home, still full of excitement at having scored such a bargain, it started to dawn on me that I actually needed to do something with all of those strawberries. But what to do? Well start off by sitting down with a cuppa and some strawberries while checking out Pinterest for some strawberry recipe inspiration seemed like a pretty sensible thing to do. It didn’t take long for me to settle on making a Strawberry Loaf. I like to call it a loaf rather than a cake because it sounds far healthier and also makes it perfectly justifiable to eat for breakfast. Same rule goes for banana loaf… banana loaf is acceptable breakfast food but scoffing banana cake as the sun rises is somewhat frowned upon by certain (non fun-loving) people! Anyway, as sweet and juicy as my strawberries were, I knew they were going to be a zillion times sweeter when baked. OMG and talk about a moist cake. 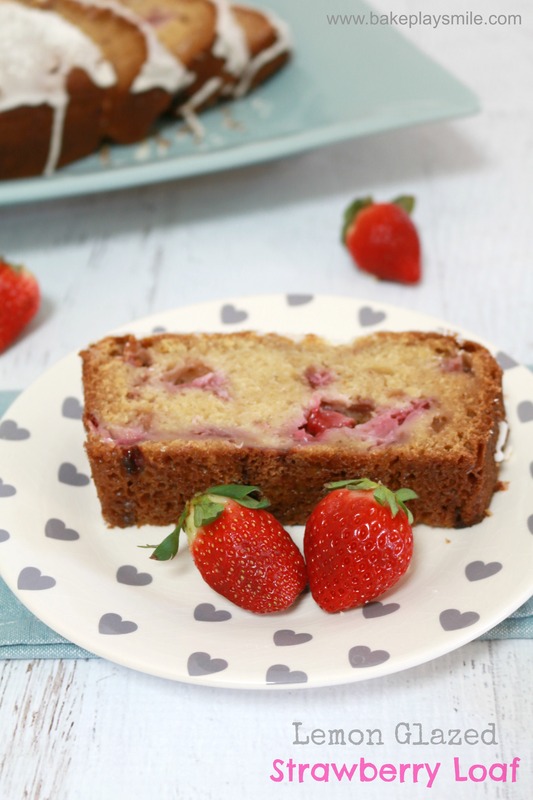 Yep those strawberries certainly worked their magic by making the whole cake (oops I mean loaf!) incredibly moist. Considering a dry cake is one of my pet hates, this moist loaf was right up on my delicious list. Now I could have definitely left the loaf un-iced and it would have been lovely. But for me, a lemon glaze was just the thing this loaf needed to go from yummy to amazing. I love the combination of the tangy lemon icing against the super sweetness of the strawberries. And a lemon glaze is just too easy to make, so there’s really no excuse not to! 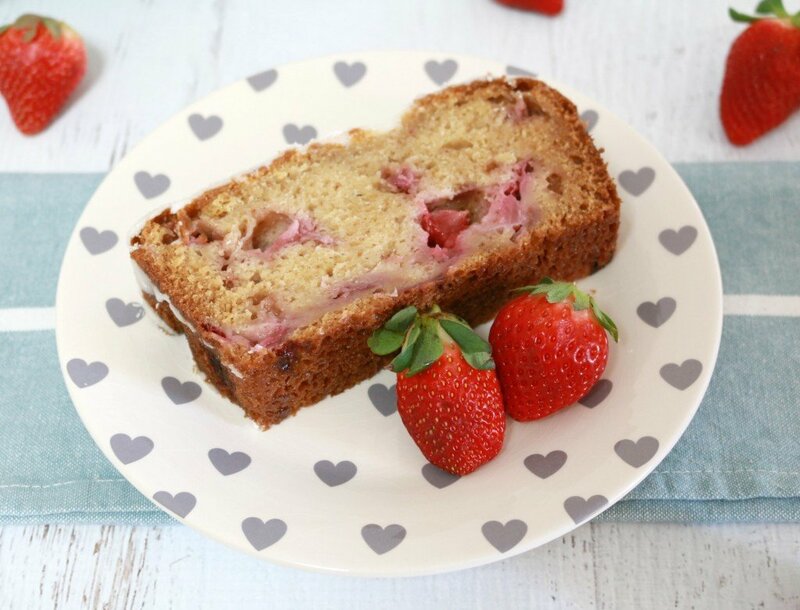 And what to do when you have a fresh out of the oven, deliciously warm Strawberry Loaf? Slice a piece, grab a cuppa and get back on Pinterest of course! Has anyone else bought strawberries for a bargain price? If so, hit me with your strawberry recipe inspiration ideas! 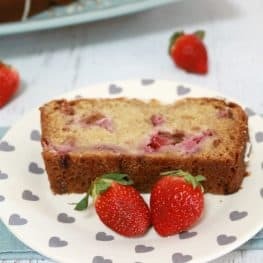 This delicious Strawberry Loaf is bursting with sweet strawberries and topped off with a tangy lemon glaze. Fresh or frozen strawberries can be used! Please note that this recipe requires buttermilk (it cannot be substituted). If you don’t have any buttermilk you can make your own by adding 1tbs of either lemon juice or vinegar to 1 cup of plain milk. 2. Spray a loaf pan with nonstick spray. 3. Measure the flour, bicarb soda, salt, and cinnamon into the TM bowl and press Turbo 4-5 times to combine. 4. Set the flour mixture aside in a bowl. 5. Measure the caster and brown sugars into the TM bowl and add the egg. 6. Mix together well on Speed 4 for 20 seconds (or until no lumps remain). 7. Add the buttermilk, oil and vanilla and mix on Speed 4 for another 20 seconds. 8. Turn the TM down to Speed 1 and slowly pour in the dry ingredients with the blades running until just combined and there are no lumps (approximately 20 seconds). 9. Place the chopped strawberries into a large ziplock bag, add in the flour and toss to coat. 11. 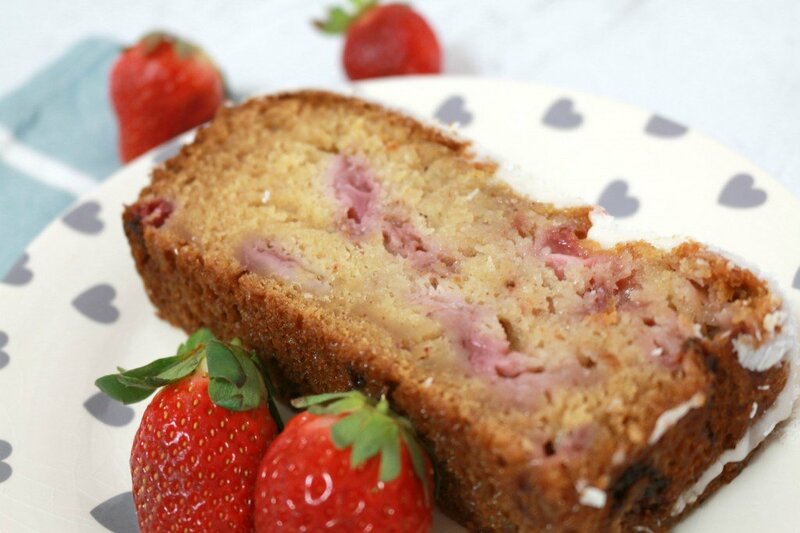 Gently fold through the floured strawberries through the loaf mixture with a large spoon. 12. Bake the bread for approximately 50-60 minutes. 13. The loaf is cooked when a skewer inserted into the middle comes out clean. 14. Allow the loaf to completely cool in the pan before turning onto a wire rack to be glazed. 15. To make the lemon glaze, place the icing sugar, lemon juice and cream in the TM bowl and mix on Speed 4 for 1 minute seconds until combined and creamy (you may need to scrape down the sides of the TM bowl). 16. 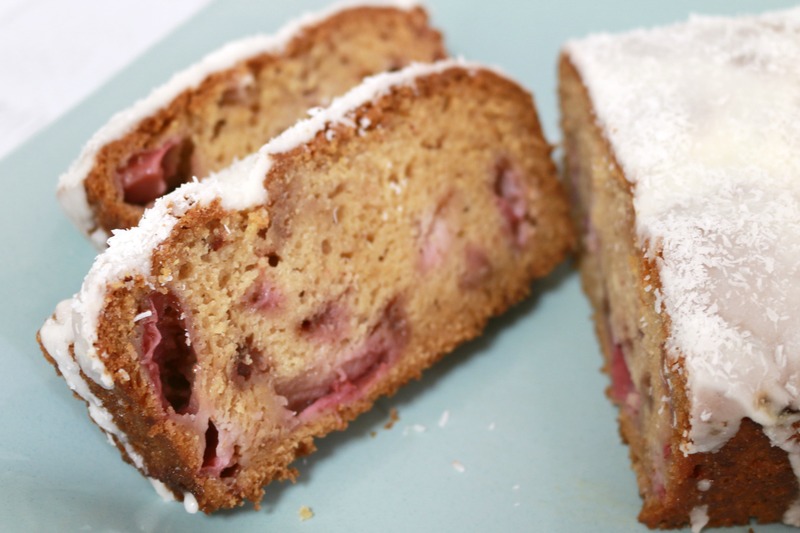 Drizzle over the strawberry loaf. 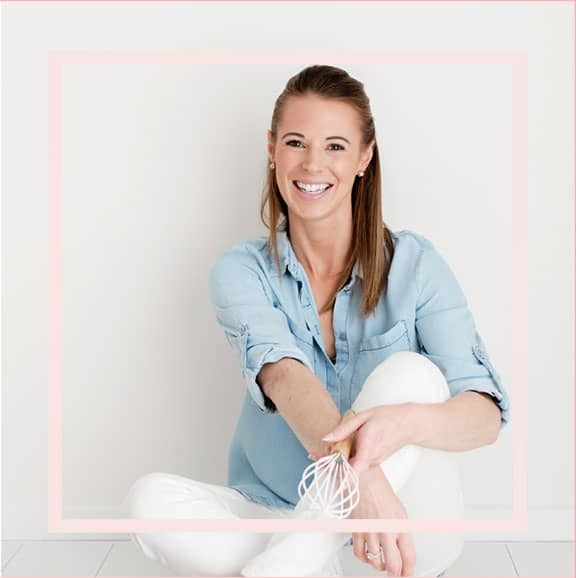 Absolutely – lemon is the best kind of friend you can have! hahaha!! reading your post and the need to buy the strawberries makes me think of my mum!! Your mum and I are kindred specials buying souls!! Mmm her slice sounds delicious! Okay, it’s 10am here and I’m sat at my desk feeling hungry and I see this. You are killing me! The internet needs a ‘feed me now’ button 🙂 Darn, that looks so good! Haha yes a ‘feed me’ button would be the best! !